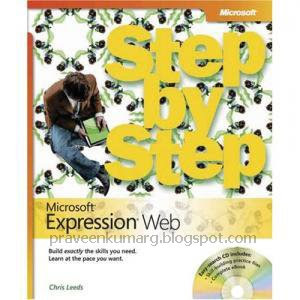 The smart way to learn Microsoft Expression Web one step at a time! Work at your own pace through the easy numbered steps, practice files on CD, hands-on exercises, and master the fundamentals of creating effective Web sites. You ll work with advanced design technologies and discover the powerful and easy-to-use Web design experience that Expression Web delivers. You’ll learn how to create professional-looking Web pages, work with powerful design tools and task panes, and incorporate support for XML, Microsoft ASP.NET, Extensible HTML (XHTML), and Web pages built using Microsoft Office FrontPage®. You ll also learn how to build templates, work with sophisticated cascading style sheets and other design features that help you to precisely control your work, and take advantage of built-in support for today s Web standards. With STEP BY STEP, you can take just the lessons you need or work from cover to cover. Either way, you drive the instruction, building and practicing the skills you need, just when you need them! Includes an easy-search companion CD with files for practicing the book s lessons, a complete eBook, and more! Includes an easy-search companion CD with practice files, a complete eBook, and other resources.